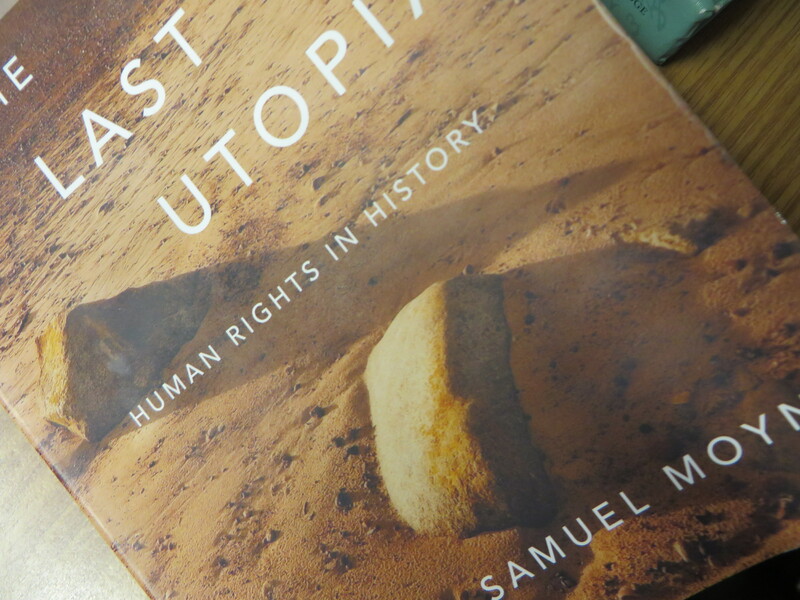 I was not expecting to need to read Samuel Moyn’s The Last Utopia: Human Rights in History, but it’s a good thing I did. The sharpness of the book lies in the clarity with which Moyn wants to delineate Human Rights discourse as a special discourse that emerges on the scene “seemingly from nowhere” in the 1970s (p.3). The claim is somewhat counterintuitive. Against the historical grain, Moyn argues that Human Rights is sui generis, distinct and disconnected from, or at least not directly or teleologically connected to the earlier forms of discourses with which Human Rights is usually associated. So no, Human Rights has nothing directly to do with the Bible or with Christianity, or Stoicism, or Rights-of-Man Enlightenment theory, or even the trials at Nuremburg, or the 1948 Universal Declaration of Man, or decolonialism. The centerpiece of the argument dividing Human Rights from Rights of Man comes down to the state. Rights-of-man discourse has as its frame of reference the state and the rights and obligations of the citizen within the space of an autarkic, free standing, sovereign state that does not recognize any political authority external to it (see especially pp.20-6). In other words, the Rights of Man are bound up with the very individual state that Human Rights is meant to transcend. In contrast to the rights of man and state citizenship, Human Rights is framed in terms of a utopian no-space whose principles transcend and trump the state. They are brought to bear upon the national-state by international bodies. There’s an upshot in all this for modern Jewish philosophy. Moyn’s framing of the Rights of Man is especially important when trying to clarify our conception of the stakes involved in the social contract theory of Spinoza, Hobbes , Locke, and Mendelssohn; and the contrast observed by Moyn speaks directly to the project of rights and liberal citizenship as the sine qua non without which you cannot properly understand the project of Jewish modernity. Jewish emancipation had as it focus not transcendent political norms, but was enmeshed in the doctrine of states and citizenship. We see this especially in Mendelssohn, and then again with Marx in the Jewish Question. But Enlightenment modernity and Jewish modernity have nothing to do with Human Rights as a trans-national, international conceptual frame. That said, I wonder if the argument strains too hard to make too clear a historical cut. Why is it “wrong” to look for early, historical precursor discourses, especially given how Moyn himself refers to Human Rights as a “reinvention” of earlier rights discourse (13)? Moyn argues that the ancient and early modern sources of universalism are overdetermined, that they combined with other forms of particularism that would have to be eliminated for a genuine universalism to emerge. But is that to say that these precursor discourses have “no real relevance to a history of [Human Rights]” (14)? I don’t understand the use here of the word “real.” I’m not sure Moyn wants to draw an absolute distinction between real and, let’s say, virtual. The better and best point is to loosen the link between precursor universalisms and Human Rights, properly understood. But there seems to be no sense as to how discourses identified in retrospect as precursors work as rhetorical foils. The “relevance” or relation between earlier and later forms may not be “real” as in “necessary” or even historical as much as “virtual” or “potential.” At any rate, we’ve known for a long time how traditions constantly reinvent themselves retrospectively, a caveat that is not meant by me to be unfriendly to Moyn’s point about contingency and discontinuity (pp.14, 15, 16). Have we seen the last word on teasing out the relationship between Human Rights and its precursors? That Christians and Christianity pop up continuously throughout Moyn’s own discussion of Human Rights would be a case in point suggesting not. What I also liked about the book is that it makes so much sense of the discourse and my own experience of it. Reading The Last Utopia jogged my own memory growing up in the 1970s, that historical period that saw the emergence of Human Rights as Moyn wants us now to know it. The focus in the book on the 1970s recalls to mind the struggle for Soviet Jewry and other prisoners of conscience, opposition to U.S. policy in El Salvador and Nicaragua, Carter), Amnesty International, and names like Andrei Sakharov, Oscar Romero, and, of course, Jimmy Carter. To this one might usefully add Alex Haley’s Roots and the NBC miniseries Holocaust as contributing to the burgeoning of Human Rights consciousness at the same period. Recalling all of this helped me make sense of Moyn’s thesis as more familiar, and not just counterintuitve. As for putting two and two together philosophically, one could relate to the Human Rights discourse, which Moyn points out was more moralizing than political, the ethical and moralizing preoccupations of Emmanuel Levinas. Keep in mind that Levinas reputation emerged on the continental and then Jewish philosophical scenes precisely in the same time period that Human Rights emerged on the international scene. The argument leveled by Moyn in the book’s epilogue as well as by others that Human Rights was never genuinely political reflects the very same argument leveled against Levinas, about whom Moyn wrote (not coincidentally?) his first book. About the relation between politics and morality, I’m not so sure. Moyn seems to want more muscle that only a maximal political program might bring to the discourse and practical enforcement of Human Rights. So yes, here again, the case is made against hapless, feckless liberalism. But I wonder what a category collapse between morality and politics would even look like (pp.213-27). I suspect that placing placelessness before place, the very notion of a “morality of the globe” that might transcend and trump the politics of the nation-state and define “contemporary aspirations” is to put the cart before the horse (p.43). It’s hard to see how this might work out in practice, and on the basis of what hegemony, what new Leviathan figure. I suspect, though, that this figure will have a place of its own, will come from and out of some place. In Jewish religion, even the All Mighty Himself takes on the name Makom or Place. This entry was posted in uncategorized and tagged ethics, Jewish Philosophy, Levinas, liberalism, politics, Samuel Moyn. Bookmark the permalink.